I don’t care what anyone says man, I loved that Blair Witch Project movie. Even today whenever I watch it, I get completely freaked out. Witches can be pretty scary, especially around Halloween time. Man, those witches are crazy. Well, if I’m going to talk about witches, I need to mention Salem, Massachusetts. Salem has a long history involving witches and I’m not going to get into it all here, but needless to say, if you want to learn about it then you can head over to Wikipedia or maybe even a trip to your local public library. For now, let’s just say that there were witch trials in Salem back in 1692. These days, Salem is a tourist attraction and all that, but it’s around this time of year in particular – Halloween time, that is – that Salem’s tattoo industry really starts to feel the effects of that tourism surge. 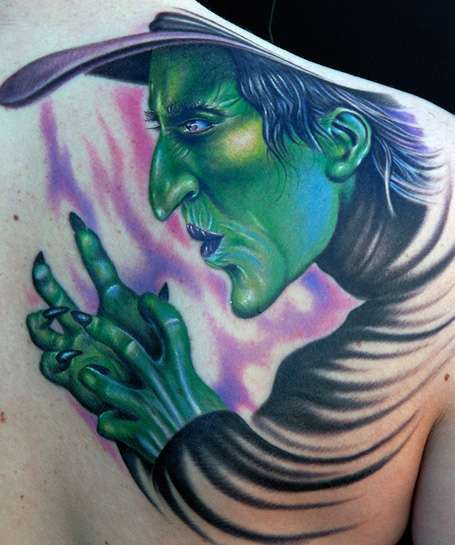 People seem to decide that they want spooky tattoos at this time of year and I guess they also decide that a way to make a spooky tattoo even spookier is to head to Salem and get one done there. ‘At Witch City Ink, Micah R.O. Litant, apprentice tattoo artist and shop manager, has seen a large influx of tattoos during this Halloween season. Seems pretty cool to me and there aren’t too many locations that I can think of that have an influx of people wanting to get tattoos during certain times of the year in honour of specific holidays. I guess it would be sort of like if there was a tattoo studio in the North Pole and people who visited it got tattoos of Santa. That wouldn’t work though because no one visits the North Pole and no one actually lives there. Except for Santa. And his wife.